This presentation is a wonderful opportunity for parish musicians and others in the northern counties of the Archdiocese to learn more about the Church’s beautiful history and practice of sung prayer. Traditional chants in both English and Latin will be introduced. History of sacred music, study of Church legislation, in- depth discussion of practical issues surrounding sacred music programs. On-line June 3-July 28, in-person July 29 and 30 from 9:00 a.m. to 4:00 p.m. Fulfills course requirements for the St. Cecilia Academy certification. Introduction to Gregorian chant, vocal and rehearsal techniques for choirs, and development of conducting skills. July 31-August 3, 8:00 a.m. to 6:00 p.m. Fulfills course requirements for the St. Cecilia Academy certification. Pedagogical techniques for teachers with special emphasis on the Ward method of teaching chant. 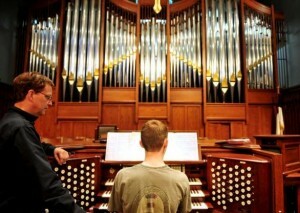 July 22–26, 9:00 a.m. to 5:30 p.m.
Pianists will be introduced to registration, organ technique, pedaling, hymn- and service-playing, and good repertoire. July 31-August 3, 9:00 a.m. to 12:00 p.m. and 3:00-6:00 p.m.